You guys. I own about 2398723872 dresses. True story. And honestly, I miss wearing them - I used to wear them all the time, which is why they consume so much of my closet real estate. I've noticed though that since I've started blogging, I don't reach for dresses as much - especially in the summer when I can't dress them up with layers. I guess I just feel like they're too easy, not creative, and definitely hard to find similar items to link to when I my exact dress isn't available. That kind of makes me sad though because I was always a dress and heels kind of person and I don't want to lose that side of me just because I know my outfits will be photographed and shared with you! So, here's a promise to wear more dresses on this blog! I wore this dress in Jamaica-- just switched the heels for these Sam Edelman flat sandals. Perfect to beat the heat and humidity on the island! If you want to see some other Jamaica outfits, you can catch them on my Instagram. BCBGeneration is one of my favorite brands to shop for casual dresses. 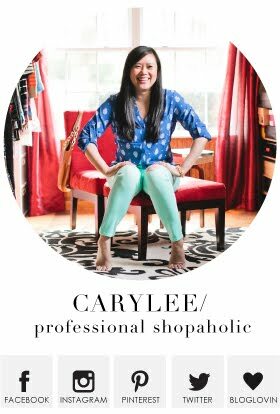 It's affordable (way cheaper price point than the BCBG mother ship), decent quality, and fun shapes, colors, and patterns. And since I feel like this brand is geared more towards juniors - the dresses are shorter, which makes it easier on me and my short self - minis fit me like normal length dresses. Usually I scour the BCBGeneration section at Dillard's - for whatever reason, I have the best luck there. I too collect dresses - but that's only because they're the perfect go to outfit option and this purple piece is no exception! You look gorgeous - LOVE this color. And those pumps are just adorable. 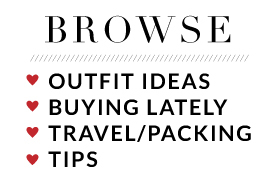 Yes, they're easy and effortless when you just want to get dressed and go! And thank you so much for the sweet note! OMG, sorry, I'm so behind on my comments!! Vacation and work travel back to back are not a good idea for the life of a blogger! But thank you! And yes, BCBGeneration is my go-to for stylish and somewhat cheap summer dresses. Love them! I've been trying to be more active on Instagram lately! Thanks so much for popping over! Cute dress, can't wait to see more! I hope not to disappoint! I'm the same, I never wear the dresses I have. This dress is really pretty though and the color is great on you! The accessories are a great and unexpected choice! That's the least I can do - make interesting accessory pairings, right? Almost have my closet is made up of dresses. They definitely need more air time! How come I didn't have you on instagram????? Problem fixed ASAP!!! Thanks so much!! I looove these shoes! They're so fun and honestly, really really comfy! It's like a teeny ball of goodness this bag! 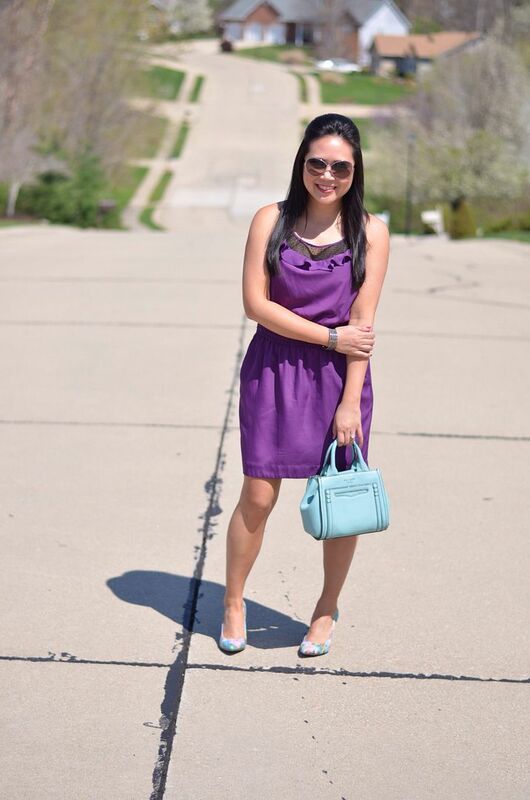 Love how you paired the radiant orchid dress with mint accessories. Those printed heels are gorgeous! Thanks so much! It's not a color combo I have worn before, but I liked it very much! I will wear more, I promise! And I wish these shoes were still available! They are a pair every girl should have for sure! My sales associate at nordstrom picked them out for me, and it was love at first sight!! I love the color of that dress. It's hard to find good purple dresses. You look fantastic! Thank you! I don't have much purple in my wardrobe at all! but I loved the shape and ruffle detail on this dress! It's fun! I love dresses too! They are so much fun to wear! Love the purple dress on you! Dresses are like incognito sweats for me :) Great to turn to when you're not having a skinny day! Thank you so so much! I appreciate that a lot! I love dresses too, and you look so pretty in yours - gorgeous heels too. Keep em coming and hope to see you back at #AllAboutYou link party tomorrow! I feel the same way about my dresses! Like they're not "interesting" enough. But we can dress them up like you did with those gorgeous heels!! Thanks so much - glad you can relate! I'm really trying to incorporate at least one dress a week moving forward!